Images supplied by anonymous sources showing sewage being pumped out from a cesspit onto garigue land at Armier. An investigation into claims that sewage from the Malta Campsite facility in Armier was being discharged into adjacent garigue land drew a blank as it could not be established who was responsible. A few months ago, the same facility made headlines after it was slapped with an enforcement notice over a long list of planning breaches that are being contesting. 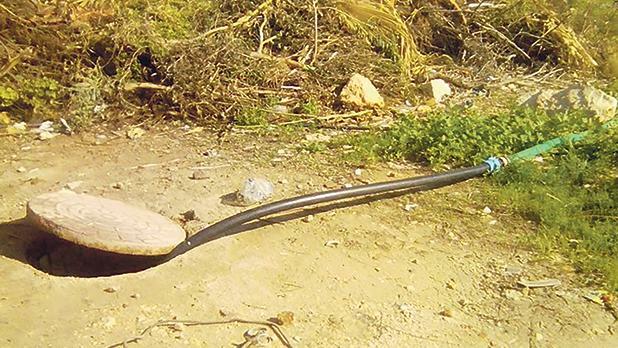 The probe over illegal dumping of raw sewage was launched in the wake of photographs received by the Times of Malta from an anonymous source. The images were forwarded to the Environment and Resources Authority last Wednesday. The photographs photos featured murky liquid waste from a cesspit being dumped into the open by means of a hose jutting out from a manhole. The anonymous source who supplied the images claimed such an operation was not a one-off occurrence but something that had already happened before. Contacted by Times of Malta, Malta Campsite administrator Vince Vella denied any wrongdoing saying the photos had been sent with the sole intention of tarnishing the facilities’ reputation. An ERA spokeswoman confirmed that an investigation had been launched. An onsite inspection was only carried out on Friday afternoon, two days after the environment watchdog had been alerted about the matter. The spokeswoman said no open manholes with sewage flowing out were found and no visible signs or particular smells of sewage were detected. Nonetheless, the regulator noted that the manhole in the photo was possibly the one located close to the campsite entrance. Meanwhile, proceedings related to the enforcement notice issued by the Planning Authority last October are still pending. According to the website of the Environment and Planning Review Tribunal, which is hearing the case, the first and only sitting was held last December, with the case being put off for an onsite inspection. Action to address one of the illegalities flagged in the enforcement notice started last month when a number of mobile homes that had been illegally placed outside the campsite’s footprint started being removed. The operation was carried out twice because, the first time around, the planning watchdog intervened after it transpired that the structures were just being shifted to another side of the facility rather than removed altogether. This newspaper received complaints that the site previously occupied by the mobile homes had been left in a mess, with debris scattered all over the place.